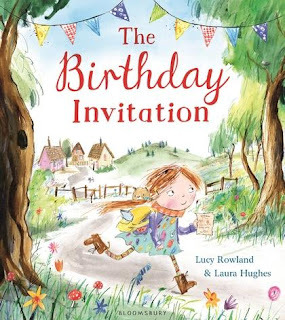 In this enchanting rhyming picture book, a whole cast of crazy characters accidentally get invited to Ella's birthday, all thanks to a misbehaving invitation. From a wizard to a pirate, a princess to a pilot, so many fantastical guests converge on Ella’s party. And when they get there, they each have a wild tale to tell about how they received the invitation. By UK author Lucy Rowland, this is a light-hearted and fun story written in flawless rhyme. The rhythm flows beautifully and the rhyme will pull you in and have you yearning to read the story again and again. The illustrations by Laura Hughes are stunning. In a bright and colourful scratchy style, the delightful details will entertain you and the mischievous invitation will captivate the kids. As the invitation travels, it leaves a dotted trail in the wind, and no child I read to could resist following the dotted line with their finger. The Birthday Invitation is one of those magical books that makes you smile and feel happy inside. With a fabulous story and impeccable rhyme, I highly recommend adding this one to your (or a friend's) storybook collection.